The Neuropilin-1 (NRP 1) and Neuropilin-2 (NRP2) receptors were initially described as receptors for axon guidance factors belonging to the class-3 Semaphorin sub-family. 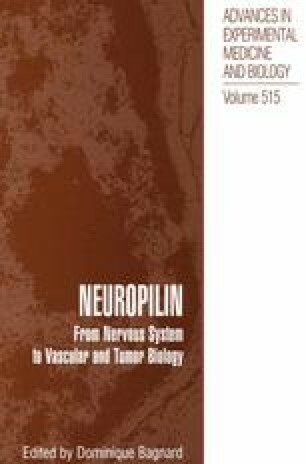 Subsequently, it was found the Neuropilins also function as receptors for some forms of vascular endothelial growth factor (VEGF). VEGF165 binds to both NRP 1 and to NRP2 but VEGF121 does not bind to either of these receptors. VEGF145 on the other hand, binds to NRP2 but not to NRP1. Additional VEGF family members such as the heparin binding form of placenta growth factor (PIGF2) and VEGF-B bind to NRP 1, and it was also shown that both PIGF-2 and VEGFC bind to NRP2.